Over 500 activists, academics and students attended a lecture by renowned American philosopher Noam Chomsky on Saturday. The meeting – organised by the Cuba Solidarity Campaign as part of the Latin America series of events – coincided with the release of Rene Gonzalez, one of the Miami Five, and the 44th anniversary of the capture and execution of Che Guevara by CIA-backed troops in Bolivia. Professor Chomsky analysed the long history of US intervention in Latin America and drew its insidious interference back to the Monroe Doctrine of 1823 which claimed the Americas as under the United States’ sphere of influence. The narrative of ongoing intrusion and imposition has been punctuated by violent interventions, but the distinguished theorist argued that progressive movements – from Cuba to Venezuela – have challenged US hegemony in the region. Chomsky discussed a number of countries – including Colombia, Venezuela, Bolivia and Nicaragua – but focussed particular attention on US involvement in Cuba’s sovereign affairs. The acclaimed academic bemoaned Cuba’s consistent inclusion on the United States’ list of nations which sponsor terrorism and noted America’s hypocrisy by harbouring known terrorists such as Luis Posada Carriles and Orlando Bosch. Following the release of Rene Gonzalez, Chomsky declared that “there are real reasons to be concerned about his safety” because Florida – where Rene is due to be held on probation for three years – is “one of the major terrorist havens in the world”. Nearly 3,500 Cubans have died as a result of terrorist attacks against the island, most of which have emanated from Miami. 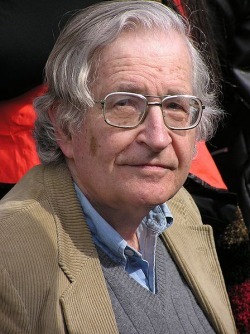 When asked about the prospect of the Miami Five receiving justice, Chomsky emphasised the need for increased campaigning and activism within the UK. “If there is substantial public pressure, and here’s where activism in England can make a difference,” said Chomsky, “the US can’t ignore popular ferment from its junior partner”. With legal avenues virtually exhausted, it is essential that we heed Professor Chomsky’s advice and intensify the political struggle to bring freedom to the Miami Five.